DS106 is a magical and serendipitous course. There’s really nothing else like it. The recent Education Technology MOOC that Alec Couros and Alan Levine, among others, helped facilitate this Winter came close to matching DS106. It had awesomely silly collaborative experiences, and fantastic conversations based around the educational use of technology that helped introduce a host of educators to blogging, but it just wasn’t DS106. There’s something about the student generated assignments, and creative constraints placed upon participants, that scratches a particularly fantastic itch for me. I decided I wanted to return the favor. The actual DS106 design assignment was to create a Dungeons and Dragons creature card for someone else, weaving a backstory for the individual chosen into the creature’s description. This is a digital storytelling class remember, so there’s a lot of fun to be had in describing fellow classmates as monsters. I was really excited to do this assignment, as I hadn’t attempted it before now, and even though I’ve only played Dungeons and Dragons once, I did spend a lot of time playing Magic: The Gathering in the mid 90s (yes, I’m a nerd). I decided to put a twist on the assignment, and rather than turn Brian into a Dungeons and Dragons monster, I turned him into a Magic card. 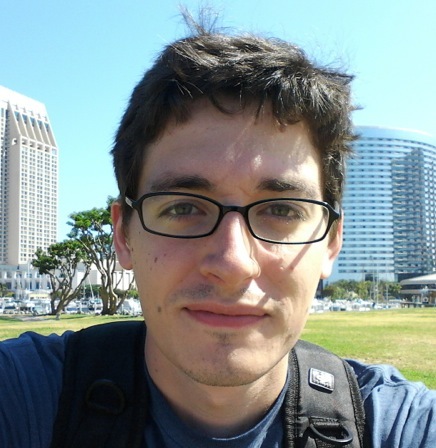 Meet Brian Bennett, the Human Educator, otherwise known as “Azamuki, the Video Lord”. For those that have never played Magic: The Gathering, it’s a skill and luck based strategic card game in which players cast spells, summon monsters, and conjure up power artifacts, representing all the magic with cards placed in front of them on a table. Each turn a player gets to draw a new unseen card from a draw pile, and hopefully have enough “mana” (magic points basically) to cast a spell. I had an absolute blast creating this card, as not only was it a special “flip” card (which I thought might be fitting for Brian), but I also tossed a couple of easter eggs into the design. For those that may still be confused about the whole concept, I took an image of the “Cunning Bandit/Azamuki, Treachery Incarnate” card and took it into Photoshop to doctor it up for the assignment. Replacing the names of the card was relatively easy, using the clone stamp tool to erase the words with the color and texture from elsewhere on the card. I left the hit and defense points the same as the original since I figured Brian Bennet the human, and Brian Bennett as Azamuki would have simliar attributes. I played with his creature type, turning him into a “Human Educator” when first brought out onto the field, but felt it was fitting to leave him as a Legendary Spirit once the card is flipped. Brian’s sort of a legend in the “Flipped Learning” world, so that worked well. The text describing the creature’s actual abilities were a hoot, and I was able to play Brian’s strength in the flipped world of video learning against Khan Academy, the defacto “Flipped Video Learning” heavyweight. The idea was devilish, geeky, and humorous all at once. 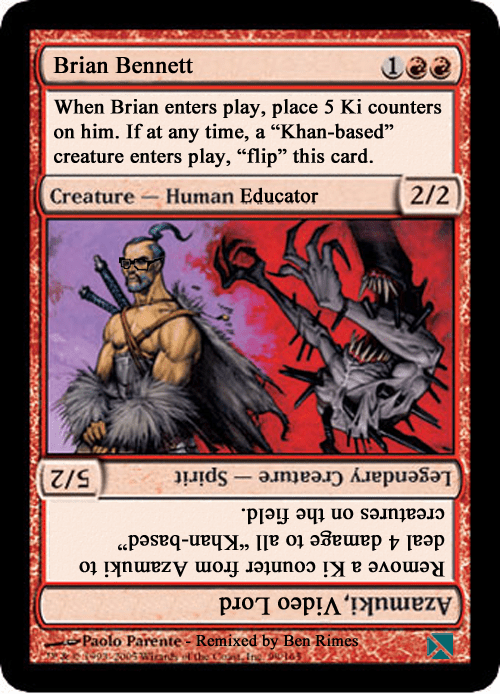 Brian’s creature card is actually a heavy-handed deterrent for anyone looking to play a “Khan-based” game of education. Once Brian is on the field of play, he welcomes all Khan creatures, but comes loaded for bear to deal with any of the shenanigans that Khan supporters might toss his way. Upon arrival of any Khan-based creatures, Brian’s card is flipped, and Azamuki is born, armed with several “Ki” bombs to lob should any Khan supporters claim individual teachers (with actual connections to the students they’re teaching) shouldn’t waste their time making instructional “flipped” videos, instead using the cookie cutter videos provided by Khan. I’m really happy about the way this project turned out, and I’m looking forward to digging a bit deeper with DS106 in the coming weeks. This assignment was a blast, and it reminded me of the Explorer Baseball Cards that I used to have my 5th graders make back when Webquests were still cool. I’m a sucker for assignments that get kids manipulating digital images, giving them free reign to explore how digital art tools can often be analogous to real world art tools, but provide a depth of fidelity that traditional paper and paint can’t achieve. Working with layers, clone tools, copy/paste, and graphic design basics are all important elements of creation with computers. You can even go younger, as I had 3rd graders that turned pictures of themselves into super heroes. They had a blast doing that particular assignment, and were able to turn them into wonderful spoken stories via VoiceThread. You don’t need Photoshop to do this sort of work either; a simple JPEG from the internet or a camera opened in MS Paint or GIMP are both great FREE alternatives that can get your students exploring the basics of digital storytelling through graphic design and remixing. Hey, I didn’t know you were in etmooc too! Somehow I never connected with you, though your name does ring a bell, now that I think about it. This card is fantastic–I love how you’ve taken Brian’s personality and what he does with flipped stuff and put it into the game. And the glasses on the character are a nice touch! 1. How do you do the upside down text? I use GIMP only, not photoshop, and maybe I’ll never have a reason to use upside down text, but just in case…. Oh wait, I bet it has something to do with rotating? 2. Is there a way to make the text you added “fuzzier” like the text in the original image? I’m just curious if that is even possible! ET Mooc was a great big conversation, which was awesome for creating some buzz, but I felt it seemed more impersonal than DS106. Not quite as intimate, and slightly more amorphous. Granted, I didn’t put as much energy into ET Mooc as I do DS106, and perhaps the size of it is what kept me from participating more. I’m glad you caught one of the little easter eggs. The other may be more subtle, but I’m sure Brian and he co-workers will identify it 🙂 As for the upside down text, I just rotated the canvas, as you suggested. The fuzzier text? Besides changing the opacity as Brian suggested in his comment, you can always use a light shade of grey rather than straight black. I also teased out a few of the edges of the text with a fine pencil tool, though it didn’t really work so well in some parts. Christina, for text, I changed the opacity on mine, which allows it’s background to show through (if you’ve added an alpha-channel in GIMP). It helps with the texturing and matching the original. As for flipping text over, you can use the “Transform” tool to select a layer and then either rotate it by hand or type in the number of degrees to rotate it. Thanks so much to both of you for the suggestions! I have heard of “alpha channel,” but don’t yet know what it is or how to add one. Looks like I’ll need to watch another tutorial or two!